What would your last meal on earth be? If you could have anything you wanted? I’ve given this a lot of thought, because, you know, thinking about weightier matters makes my head hurt. So do football games, which is why I would totally (not) watch the Super Bowl for the food. Not having more than four consecutive hours of sleep in almost eight months doesn’t help, either. My meal of choice? Unfortunately my answer changes with whatever I happen to be craving. Or the seasons. Authentic street tacos are high on the list, though. Drippy, tender, shredded beef would be second only to batter-fried fish. This recipe isn’t a quickie, though. For that reason, I make a LOT and freeze some of it. For the base I use these slightly menacing-looking dried chiles you see in the latin food section of the grocery store. I used to be scared of them until I made the best Chicken Tortillas Soup ever. 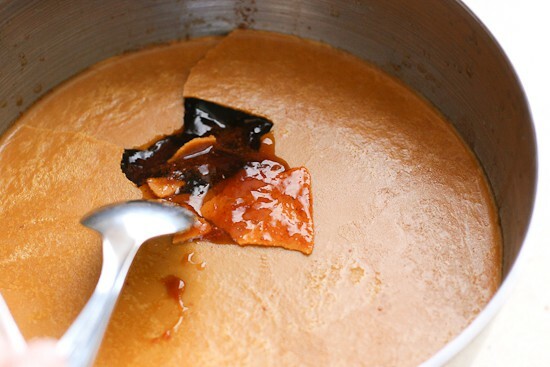 That soup has become one of our staples, and I keep these chiles in the pantry all the time now. First they need to be soaked so they blend easier. Put them in a bowl and cover with hot water. I put another bowl on top so they stay submerged. After a few hours, I pull them out, pull the stems off, and get most of the seeds out. 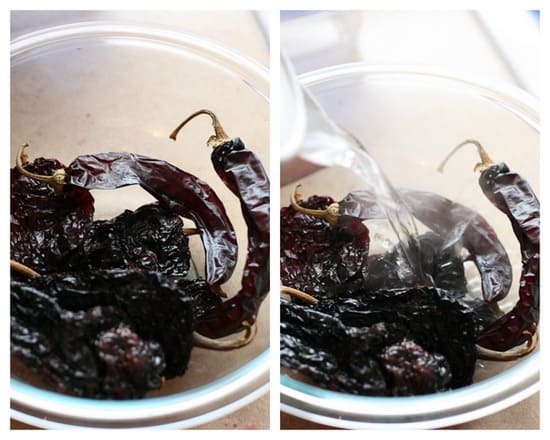 The chiles go into the blender. . .
. . .along with a bunch of other stuff, and become a really concentrated chile/enchilada paste type of thing. Sear the roast. For this recipe I used two roasts that were roughly 2 pounds each. Eight hours later it’s dark and the lighting in your kitchen is kind of cruddy, so you use your phone to take a picture so it looks all yellow-ish and hipster like you did it on purpose. Oh, and the meat falls apart, too. Separate the meat from the juices (strained, preferably). And that juicy stuff you’ve got in that bowl? Pretty much the best enchilada sauce ever. You can use it for lots of things. I made another version of those Stacked Roasted Vegetable Enchiladas with the shredded meat and sauce. And lots of spinach. Wowza, it was good. Or tacos. 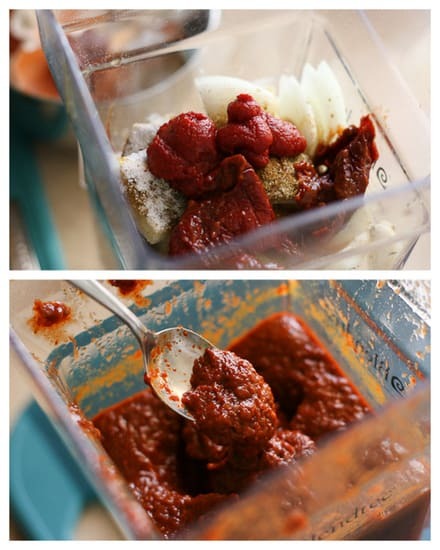 Throw some of the meat into a skillet with a few spoonfuls of that sauce and you’re set. For the entire football game. Or for life. Or. . . for whatever that comes after that. It’ll sustain you. 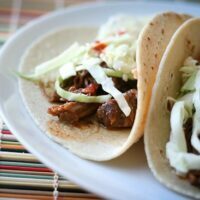 This recipe takes a little time, but you end up with a giant pot of the most flavorful, authentic-tasting taco beef you've ever had! It also freezes well for tacos down the road. Heat a skillet to medium heat and add the dried chiles. Toast for a minute or so until they become fragrant. Don't let them burn. 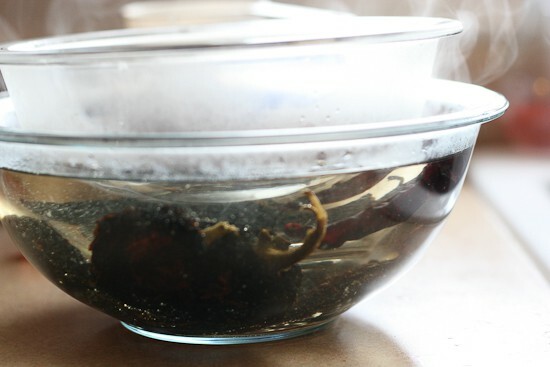 Transfer to a bowl and pour boiling water over them. Add another bowl on top of the chiles to keep them submerged. Let them soak for at least 30 minutes, up to a few hours. 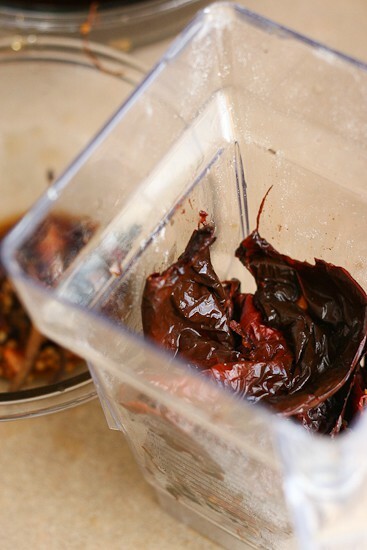 Drain chiles (reserving the liquid), remove stems and most of the seeds, and place them in the blender with the remaining ingredients (except the beef). Blend until smooth. Add some of the chile-soaking liquid if necessary. Set aside. 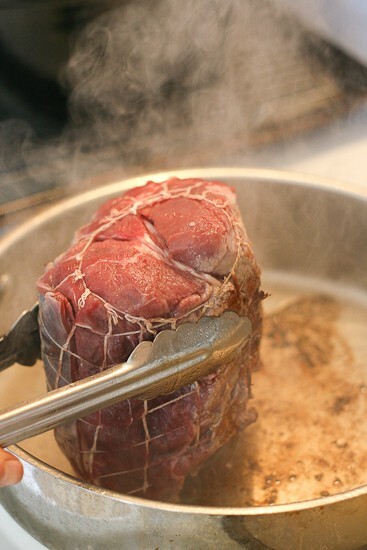 Unwrap your beef and do whatever you need to do to get it ready for the pan (trimming, etc.) Heat a cast-iron or stainless steel skillet with 2-3 Tablespoons of heat-safe oil (like coconut or grapeseed) over high heat. The oil should be shimmering and there should be very faint wisps of smoke. Place the beef in the skillet (you should hear some crazy sizzling or your pan isn't hot enough) and let it sit there for a minute or two. Turn the meat to sear on all sides. It should be crusty brown in spots. 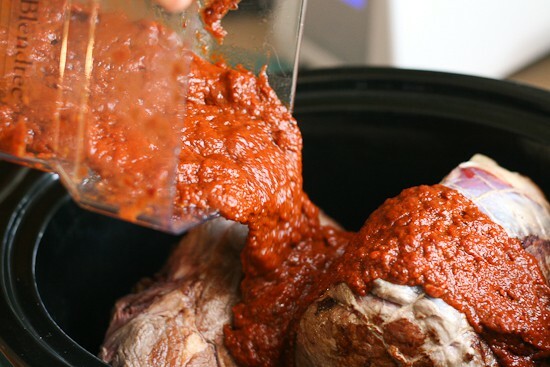 Transfer seared meat to a 6-quart slow cooker. Pour blended sauce over top. Cover and cook on low for at least 8 hours. When the meat is tender, remove roasts from the cooker and shred the meat. Set aside to cool for a few minutes. Strain the liquid in the cooker, discarding all the slimy stuff. Pour strained liquid into a bowl and set aside to cool. If you want to serve the meat and sauce together, put some meat in a skillet with a few spoonfuls of sauce and cook until the meat has softened and everything's all saucy and happy. I am loving all of the peppers in this!!!! 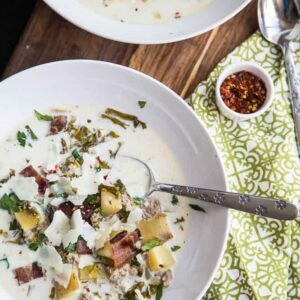 Totally using this recipe tonight with chicken! Hmm that is a tough question but I think I would have some kind of street food on my last dinner menu. It’s usually pretty delicious. It’s a darn good thing I’m going to the store today. Thanks! And you made me day with your response! I wanted to clarify that my “short list” was meant to refer to the “Top 10” list of items I miss, not that I only have a short list of items I miss in ID… : ) This recipe reminds me of things on my longer list like WINCO and the Latin section of the grocery store that was as long as the whole isle (now it’s 4-feet long and carries mostly cans from Ortega and Old El Paso rather than the real deal goods)! Thanks for all the laughs along with your recipes! Well I would have a pepperoni pan pizza from Pizza Hut and I’m not ashamed. It’s AWESOME, okay? With a few pieces of fried chicken. And homemade Cheez-its. And shredded beef! Oh my gosh. It looks so good. I need to find me some good beef! Yum! I lived in Mexico for a year and just adore Mexican street tacos. Looks like you did a great job! Darn it. You know I’m powerless to resist these kinds of dishes. I love this post :-) And you’re right … I do have three. 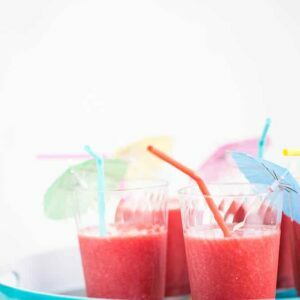 Soooooo….these look totally amazing and I will be making them very soon. It’s kinda funny because my 5-year-old actually begs me to buy those scary-looking chiles from the store. He thinks they look cool. So, yeah, he will be happy about this dish. I also bought a half cow from a rancher who does grass-fed, organic, hormone-free beef locally. It’s all in my freezer. So if I thaw a couple of roasts and then cook them like this, I can freeze them again without a problem? Or did you use fresh roasts? I’ve heard different things from different sources, but I’d like your practical advice. Does it taste good from the freezer the second time? Because that’s what really matters! Hi Sarah! 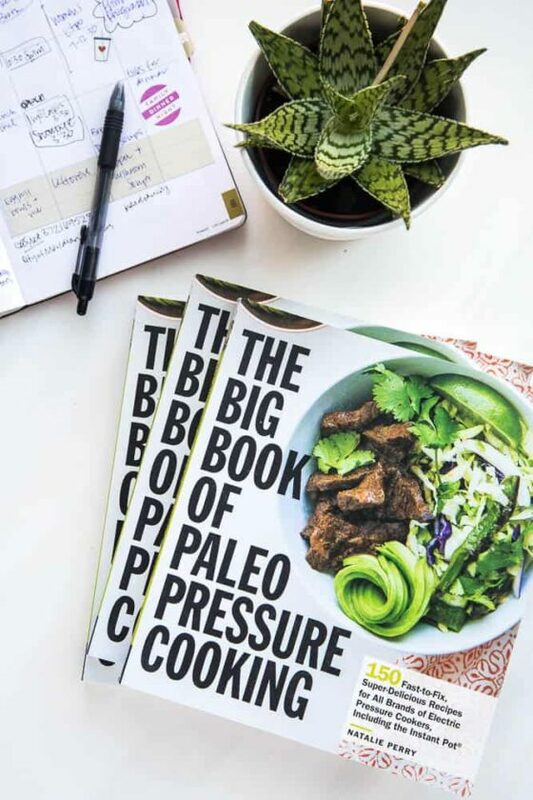 You know… I like all of the recipes I post (otherwise I wouldn’t post them) but there are some that I’m so in love with and wish that every human being who reads my blog would try. This is one if them. I’m so glad you liked it as much as I did! No, I don’t have any shredded pork recipes. And I most likely won’t. With the exception of cured pork, I really don’t like pork that much. I know I’m weird. I’m not sure if its the taste or texture or what, but it’s not my favorite. If I did, I’d for sure get a half hog like you did and fill me freezer! It’s the best way to go! I’m always looking for new slow cooker recipes, and this one looks just my style. I can’t wait to give it a try! Moving from L.A that has a taco stand on every corner to Seattle where you can’t find one decent Mexican Restaurant, let me just say I miss it. 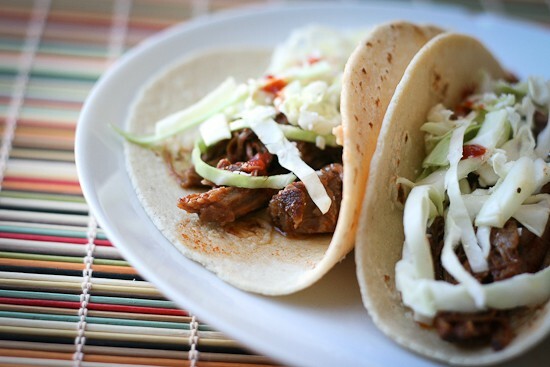 I’ll have to make this recipe soon because I am having a serious hankering for taqueria style beef tacos. 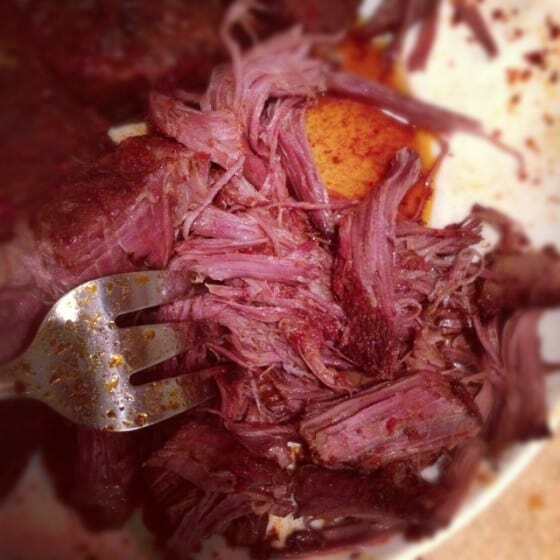 I made the shredded beef yesterday, (YUM!) and have saved the sauce to use as enchillada sauce. (Mine turned out WAY spicy – I used 4 huge pasillas, and followed the rest of the recipe as called for… maybe I put too many peppers or seeds in? Only the girls really care, the boys like the heat.) Anyway, do you have a specific enchillada recipe you like to use for the sauce? I am curious about what tortillas you use….since most are NOT paleo. Do you just “cheat” or do you make your own?? Hi Carole! When it comes to tortillas I’d rather use lettuce leaves instead of trying to find or make paleo tortillas (I don’t think they exist! Or ones worth eating at least.) So when we do taco night, I make corn tortillas from scratch to at least avoid the gluten. Looks great. 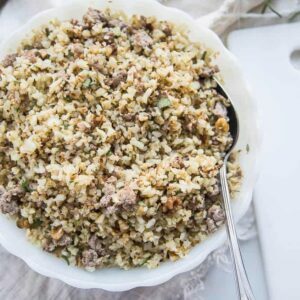 What kind (cut) of meat did you use or do you think works best for this recipe? 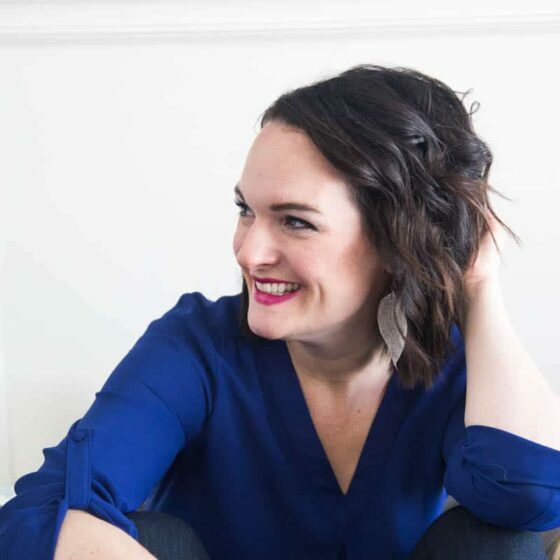 Hi Megan! Larger cuts of meat work well, like chuck or rib roasts. Made it BOMB thats all I have to say. I made a huge batch of this for a family birthday party and they were fantastic. I wasn’t able to get some of the peppers where I live but I just modified the best I could and the sauce was still great. I made homemade flour tortillas and with the leftover I made an awesome mexican lasagne. 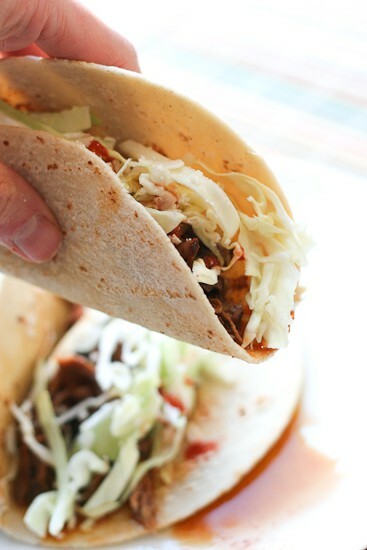 Tortillas, meat, sauce, cheese, repeat! Thanks for letting me know, Irene! And that’s exactly what I do when I have leftovers. That sauce is AMAZING, isn’t it? Glad you enjoyed it! Thank you for a wonderful recipe! This beef, and the sauce, are really great. Super simple to throw together too, which is always nice.